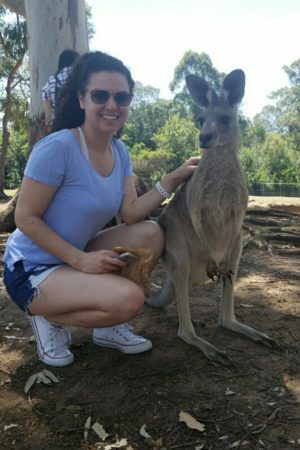 Monica Chavarria, Marketing senior, pets a kangaroo in Australia. 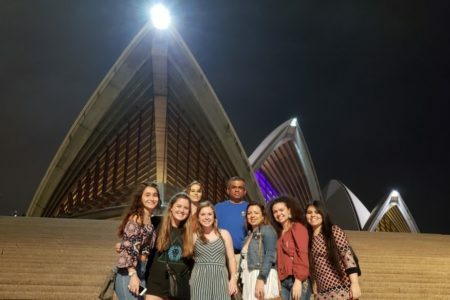 In March, 11 St. Mary’s University students in a Core Curriculum capstone class — SMC 4301: Prospects for Community and Civilization — traveled to Australia for a week. It was the first time a Core class was held abroad. “It gave an opportunity for students from all disciplines to have an international experience prior to graduation,” said Mathew Joseph, Ph.D., Emil C.E. Jurica Distinguished Professor of Marketing, who taught the class. The students, about half whom were business majors, visited Brisbane and Sydney, making stops at Queensland University of Technology and University Technology Sydney — and sneaking in time to visit with some kangaroos. Mathew Joseph, Ph.D., Emil C.E. Jurica Distinguished Professor of Marketing (center), poses with his students in front of the Sydney Opera House. Joseph said his students also sat in on presentations from 10 companies, including the Sydney Business Charter, American Express, Deloitte, Marsh & McLennan Companies and the New South Wales Department of Industry. Monica Chavarria, Marketing senior, said flight delays and navigating the Australian streets were extracurricular experiences that reminded her of the importance of adjusting and adapting — which reflects one of the elements that characterize a Marianist approach to education: to educate for adaptation and change. “This is an important lesson as a graduating senior because I will have to adapt to many situations in the workplace,” she said.